When Jill Richardson and her husband were thinking of going on a mission trip with their three small children, there were not a lit of resources for them to turn to. 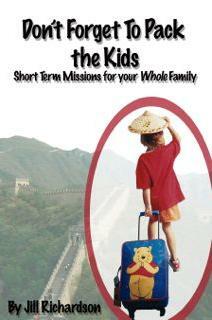 Their experiences and the demand for information spurred her to write, Don’t Forget to Pack the Kids: Short Term Missions for Your Whole Family. The book is broken down into three parts; the why? the how? and what now? The first part – the why? – looks at the question of whether or not to go. Jill shares her own stories, scriptures and input from experts in the field. After making that decision, you move into the next part of the book, the how? This is really the nuts and bolts type of information. Jill devotes several chapters to getting everything lined up and ready to go. The final part of the book is the what now? Jill provides very practical ideas for not only remembering the experience, but also how to keep the family connected to the mission even after returning home. In addition to these very informative, easy to read chapters, Jill also adds a spiritual gift inventory and a family Bible study. These are very critical to determining what your family is best suited for when selecting a mission trip. I would recommend this book to any family who has thoughts about going on a mission trip together. I am certain it will impact your family’s life in numerous ways.